I have been jonesing for a replacement for Warlords 2 for a long, long time. 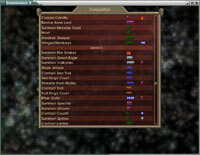 Ilwinter Design's game Dominions 3: The Awakening comes tantalizingly close to being that replacement. Today, I want to take a look at the game — available for Mac OS X, Windows, and Linux — and talk about its high and low points. I had tried the demo for its predecessor last year, and been impressed. There were a lot of rough edges, it's true, particularly around the user interface, but it was an ambitious game with strategic depth. On the surface, one could be forgiven for thinking of Dominions 3 as being yet another Risk-like game. 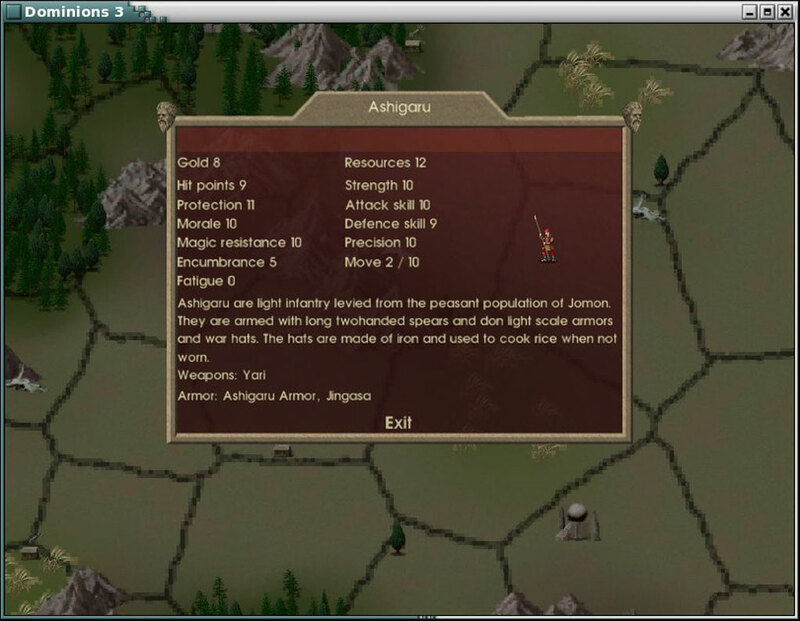 It has a map, and the map is segmented into territories, and territories generate resources which can be used to buy armies or units. That's where the similarities end. Dominions bears as much resemblence to Risk as Capture The Flag With Stuff bears to Tag. The conceit of the game is that your nation is led by a Pretender God whose goal is to ascend to the seat of heaven. In order to do this, you must spread your influence, or Dominion, over all the territories in the world. When you have more influence in a given territory than any other Pretender God, it is said to be under your dominion. Dominion spreads outward in a radius, in varying strengths, from several sources. Your Pretender God radiates Dominion, as do his or her (or its) priests and temples. Since opposing units and temples interfere with your Dominion, you must conquer their territories, rout their armies, pillage their women, sexually assault their cattle, and generally act in a way completely consistent with the history of many monotheistic religions, which is to say "with overwhelming brutality." Armies are purchased with both money and "resources." Money builds up in the treasury and can be saved from turn to turn; resources are use-them-or-lose-them. Both resources and money are multiplied by and collect in fortresses, at the cost of draining the surrounding regions of both. When opposing armies meet, the battle is resolved automatically, by the computer. You'll receive a report telling you who won and how many units were killed, and be given an option to watch a replay of the battle. Choosing to do this takes you to an animation of your two armies clashing, demonstrating exactly who killed who and with what weapon or spell. Large battles are quite impressive to watch. The immediate goal of a battle is not to kill every unit, but to force all of the opposing armies to rout. One does this by either inflicting heavy enough losses, or by killing their commanders. Spellcasting is a major part of the game, and can influence battles greatly, especially since many of the spells in the game improve the skills of your soldiers, or degrade those of the enemy's. In order to cast a spell, you must first research it. Since most of the units that are powerful spellcasters are also the best researchers, and since you can only research spells in certain locations, this creates a challenging tension where some of your best units will be far away from the front lines, hunched over books, studying instead of fighting. Now that's my kind of job. Your control over units in battle is oblique and subtle. Once a battle begins, you have no input whatsoever. Armies can only move from one location to another when grouped with a commander. You can (and must) group units into cohorts that act as a single unit. 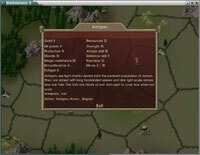 You position these groups relative to one another, and then give each cohort (or commander) a set of standing orders that they will try to follow to the best of their abilities: "fire arrows at the closest enemies", "fire arrows at the rearmost enemies," "stay in the back and cast spells," "advance up the side of the battlefield and try to flank the enemy." If you give no orders, the cohort will simply try to figure out what it should be doing. This conundrum, in one form or another, forms the core of the strategic challenge of Dominions. Your armies are recruited in a multitude of territories, and by and large the challenge isn't "recruit enough troops to win battles" but "get those troops to the right place so they can win battles." In my first few games, I found myself sweeping up large swaths of territory. Then, without any effective recruitment and deployment strategy, the game ground to a halt as the computer players and I swapped ownership of some central territory every turn. Winning the game isn't so much a matter of conquering territory, but of conquering territory that you can defend while still being able to attack the opponents' weak spots. This gives it a strategic depth that is missing in many games. All is not wine and roses. 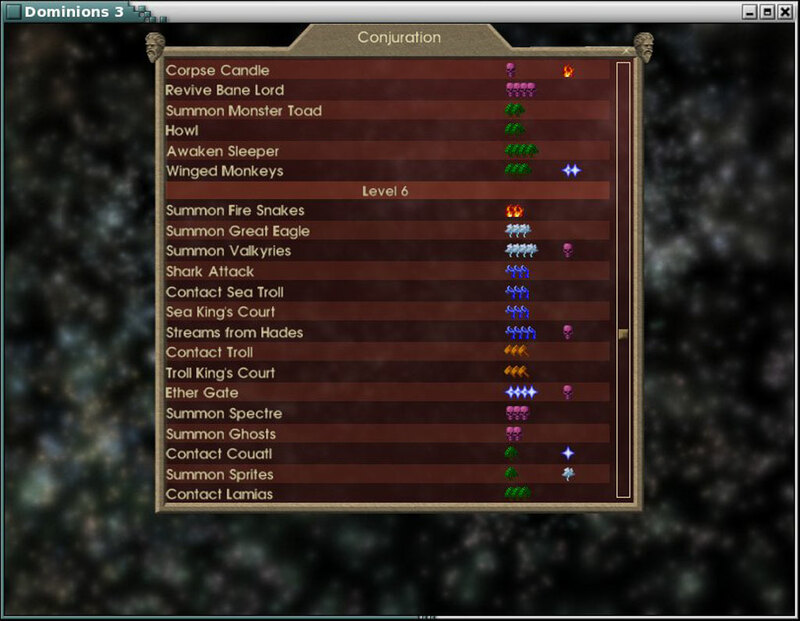 While more polished than its predecessors, Dominions 3 is still somewhat roughly-hewn. 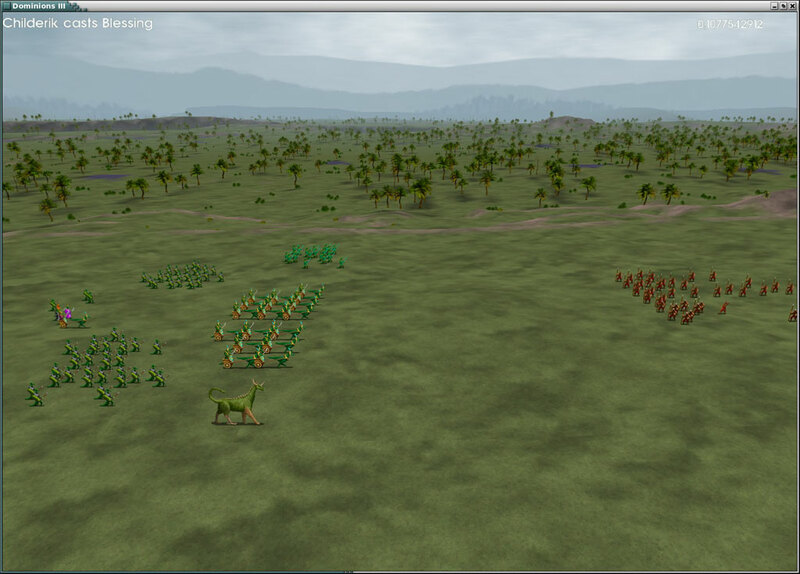 The graphics assets are fairly primitive, though this is a forgivable sin in a turn-based strategy game. The user interface, while not actively awful, is merely "just good enough." This affects gameplay somewhat because one's territories and armies quickly multiply to the point where you simply can't keep track of them. I would desperately have loved to have some facility equivalent to the "vectoring" of armies in Warlords 2. Instead, at some point on the larger maps the number of balls in the air becomes too great to manage. My solution to that is to shut down my higher brain functions and leave some potentially useful army halfway across the world, forgotten. I'm sure there are ways of dealing with this problem, but the game doesn't make them obvious. On the plus side is the nearly obsessive-compulsive level of detail that has gone into the game world, the spellbook, and the game balance. There are 50 playable nations, over 1500 units, 600 magic spells, and 300 magic items, all of which have detailed descriptions and a real sense of character. The music is melodic and arabesque, and is enjoyable on its own terms. And there's one detail that maybe doesn't matter to a lot of people, but that I think is a very nice touch. The game comes with a 300 page printed manual. So a tip of the hat to Ilwinter and Shrapnel for not making me fire up a PDF reader to find out how to play their game. The game supports both hotseat play and play by email, but I don't have any friends other than psu, and he won't play any game that requires him to hit anything other than the "x" button on his gamepad. So I'll leave the multiplayer part of the review to someone else. 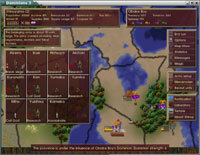 Dominions 3 is a traditional strategy gamer's game. The casual gamer, or the gamer who prefers a purer and more streamlined game, will likely find it too baroque and involved to enjoy. In many ways, it is the very antithesis, philosophically, of Advance Wars, a game I've lauded for combining ruthlessly crisp strategic and logistical considerations with a drop-dead simple user interface. How, then, can I explain the fact that I like Dominions in spite of the 1500 units, and the 600 magic spells, and the detailed setup required for combat preparedness? The answer, I think, lies in vision. Most games that are too big feel like they are designed by committee. Dominions 3 on the other hands, feels like a story grabbed hold of its two Swedish developers, and just wouldn't let go. Yes, it's too big. Yes, it's a bit unwieldy. Yes, I wish they would license the battle visualization engine from the guys who made Legion Arena. But there's something authentic about the game. The designers made the game that they really, really wanted to play. And that is somehow infectious. 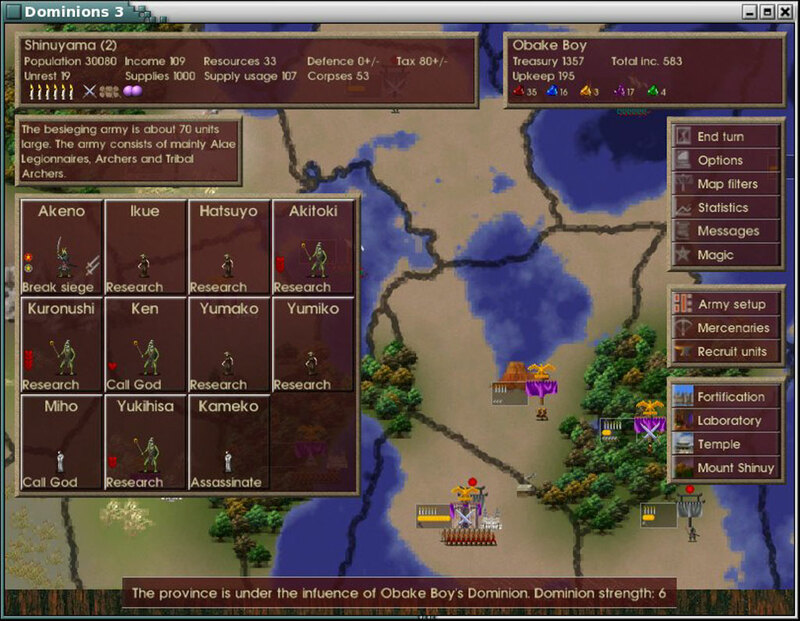 Dominions 3 is available for Mac OS X, Windows, and Linux for $54.95. Free demos for all three platforms are available from the publisher's website. Diclosure statement: The publisher of Dominions 3, Shrapnel Games, graciously provided a copy of the game for review. Nothing else has been, yet. Decent review, Peter, and it covers many of my minor complaints with Dominions 3 - though I still need to spend a lot more time with it than I have. I find it much more user friendly that its predecessor, but still makes only minor concessions to newbies. The manual goes a long way, here, especially the intro strategy section. Is it as good as Rome: Total War, Andy? It requires a lot more thought about how you will handle unexpected situations than Rome does, but it's a lot harder to get attached to your expendable hordes when you are a god. Plus, magic ain't my bag.